Roswell Alpharetta Family Dentist :: Gums Have Lucky Numbers! Numbers are everywhere, every day. There are lottery numbers, lucky numbers, sleep number beds, ages, addresses, and phone numbers. Did you know your gums have numbers too? When you visit our office, Dr Johnson or our hygienist, Samantha will exam your gums to measure the “pocket depth” and call out a bunch of numbers. We do this every visit on every adult. 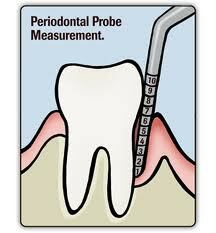 Healthy gum measurements are 1-3mm. If they are 4-5mm, you have some work to do and may need to make some changes in your daily oral hygiene. You need to go get new floss and/or interdental cleaners. If the numbers are 6mm or above, you have a problem. At this point , tartar has built up and hardened. Many times it is well below the gum line. This means, even if you started brushing and flossing like crazy, you won’t be able to remove it. This “plug” of calculus is trapping bacteria in your gums. If the numbers are about about 7 or 8 , you may already be in danger of losing your teeth due to bone loss. So, you see, regular visits to the dentist really are really important. Some people seem to be genetically programmed to build up plaque and calculus and require cleanings 3-4 times per year. Some can get by with 2 times per year. The important thing is to find out what your numbers are!